<- Click on photo to ENLARGE. 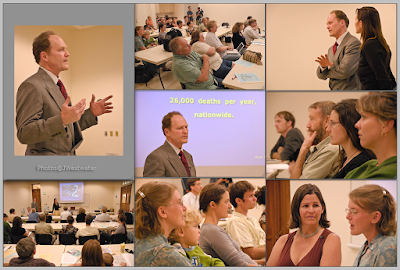 Our September 19th meeting was a big success. With 35 people in attendance, the Utah Physicians for a Healthy Environment and the Utah Moms for Clean Air greatly impressed the audience with the critical state of Utah Valley's air quality, and the serious threat it faces from coal-burning power plants and vehicle exhaust. The event was well covered by the media. Articles about the event appeared both in the Provo Daily Herald (click HERE to read) and the Salt Lake Tribune (click HERE to read). KSL radio also called for an interview with the presenters. In addition, a film crew from Your Environmental Roadtrip Tour (YERT.com) was present to film the high impact presentations. They plan to post an extended clip from the presentations at their website, visited by contemporary viewers interested in the environment. 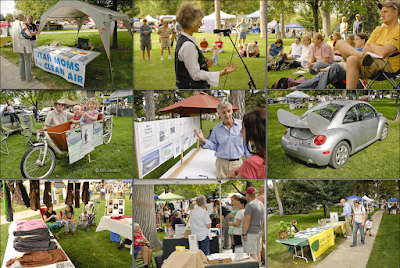 It is amazing how far the Utah Valley Sierra Forum has come in a matter of 10 months. We owe it to those who are supporting and contributing to what we do. We owe very special thanks to Bepe Kafka who recently resigned as our hard-working Vice Chair of the UVSF, and to Marsh McLean who tirelessly directed and helped bring into being the "Living Green in Utah Valley" Expo which recently took place in Provo. Hats off to you both!! 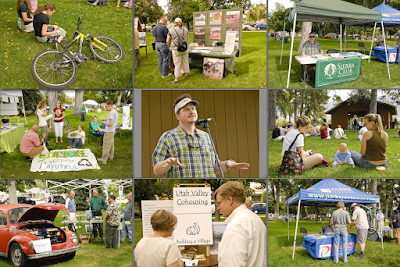 On Saturday, September 15, the Living Green in Utah Valley Expo came into being. The product of a herculean effort by Marsha McLean and others, with limited resources and put together in a short period of time, the Expo had 20 green exhibitors and 4 presenters, from Dr. Diane Neilson, Governor Huntsman's Energy Advisor, to experts on transportation, water conservation and community cohousing. The expo was designed to help educate, equip and inspire Utah Valley residents to live better, smarter, healthier and sustainable lifestyles–ways of living in better harmony with the environment of this beautiful valley. Another Living Green Expo is planned for about the same time next year. We hope this will become an annual and important event for Utah Valley. Contributing sponsors of the event and Expo advertising were UTA, Central Utah Water Conservancy District, MCR Recycling, Rocky Mountain Printing, Historic Downtown Provo and By Right Sell Right Powerhouse Realtors. The Director of the Expo was Marsha McLean. Photos ©JWestwater. Please read this news article and make your suggestions as to what we can do. One of the easiest changes to make when becoming more environmentally aware is discontinuing the use of plastic bags. We know that one person can make a difference by not using plastic bags and there's a lot of personal joy that comes from knowing that you are doing your part, albeit small. I love these envirosax. Not only are they beautiful and eco-friendly, but each bag holds the equivalent of two plastic grocery bags! 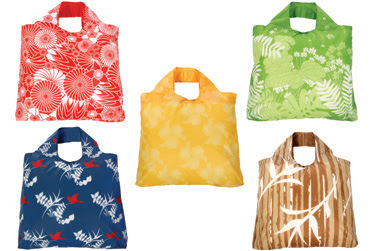 Envirosax is an Australian company and they sell these bags in a variety of styles and designs. They now have a USA store online and the website is a lot of fun to look at. For $35 you get 5 bags rolled up in a larger bag that you can keep in your car or you can keep a bag or two in your purse as well. Other fun bags I've seen around online are from Carry A Bag and I'm Not a Plastic Bag and others seen over at Tangled and True. Whenever I use these bags or bags like them, everyone notices mainly because they are so attractive, but almost everyone stops and says, "I never thought about doing that!" or "What a great idea!" or "I want to start doing that!" Even if their motivating factor is because the bags are so cute, or because it's trendy to be green, who cares, right? They notice that I am not going to use plastic bags. Most people are unaware of their own impact on the environment and sometimes all it takes is to see one thing. That's how it happened for me. Bags like these can also be homemade or be bought for practically pennies at health food stores and other places. I love these beautiful alternatives to plastic bags. They make me happy.